In the photos, we get a glimpse at director and executive producer McG as he sets the scenes for the debut episode and works one-on-one with the actors. From the Pandemonium scene to the Fray household, here are some BTS photos with McG, Katherine McNamara, Emeraude Toubia, Matthew Daddario, Harry Shum Jr., Isaiah Mustafa, and Maxim Roy. SHADOWHUNTERS – “The Mortal Cup” – One young woman realizes how dark the city can really be when she learns the truth about her past in the series premiere of “Shadowhunters” on Tuesday, January 12th at 9:00 – 10:00 PM ET/PT. ABC Family is becoming Freeform in January 2016. Based on the bestselling young adult fantasy book series The Mortal Instruments by Cassandra Clare, “Shadowhunters” follows Clary Fray, who finds out on her birthday that she is not who she thinks she is but rather comes from a long line of Shadowhunters – human-angel hybrids who hunt down demons. Now thrown into the world of demon hunting after her mother is kidnapped, Clary must rely on the mysterious Jace and his fellow Shadowhunters Isabelle and Alec to navigate this new dark world. With her best friend Simon in tow, Clary must now live among faeries, warlocks, vampires and werewolves to find answers that could help her find her mother. Nothing is as it seems, including her close family friend Luke who knows more than he is letting on, as well as the enigmatic warlock Magnus Bane who could hold the key to unlocking Clary’s past. (ABC Family/John Medland) CENTER: HARRY SHUM JR.
SHADOWHUNTERS – “The Mortal Cup” – One young woman realizes how dark the city can really be when she learns the truth about her past in the series premiere of “Shadowhunters” on Tuesday, January 12th at 9:00 – 10:00 PM ET/PT. ABC Family is becoming Freeform in January 2016. Based on the bestselling young adult fantasy book series The Mortal Instruments by Cassandra Clare, “Shadowhunters” follows Clary Fray, who finds out on her birthday that she is not who she thinks she is but rather comes from a long line of Shadowhunters – human-angel hybrids who hunt down demons. Now thrown into the world of demon hunting after her mother is kidnapped, Clary must rely on the mysterious Jace and his fellow Shadowhunters Isabelle and Alec to navigate this new dark world. With her best friend Simon in tow, Clary must now live among faeries, warlocks, vampires and werewolves to find answers that could help her find her mother. Nothing is as it seems, including her close family friend Luke who knows more than he is letting on, as well as the enigmatic warlock Magnus Bane who could hold the key to unlocking Clary’s past. 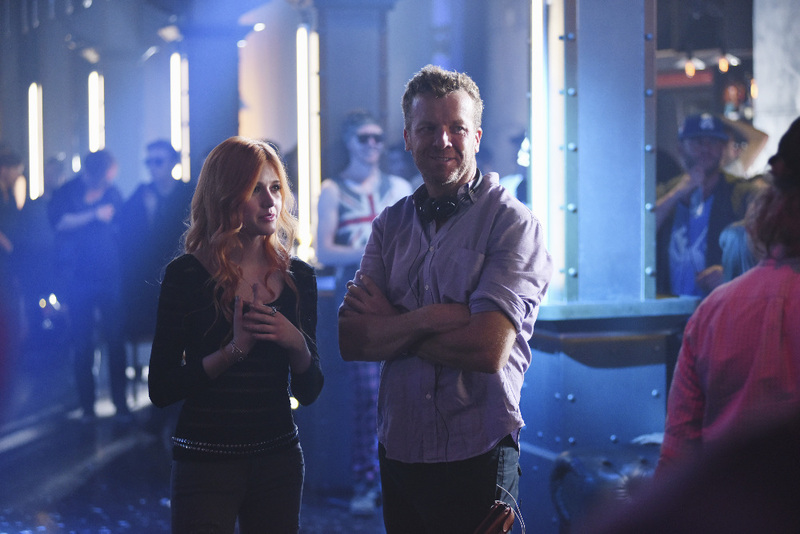 (ABC Family/John Medland) CURTIS MORGAN, MCG (DIRECTOR), HARRY SHUM JR.
A half-hour special, Beyond the Shadows: The Making of Shadowhunters is set to air this Sunday at 9:30/8:30c on ABC Family/Freeform. Shadowhunters premieres Tuesday, January 12 at 9/8c on Freeform. Hard at work they look to be. Dom is a cool looking Jace! Arrogant and sure of himself! Aww love the Lightwood sibling photo! !